Though it was introduced months ago, Quattroholics everywhere have been waiting for more photos of the Audi TT RS. Thankfully, Audi has now released a ton of new hi-res images of the TT RS in both coupe and roadster forms. The only disappointment is for those of us living in the United States. Unfortunately, as it stands, the 340 horsepower TT RS will never hit our shores. Below you'll find 47 new hi-res photos and a new press release detailing everything you've ever wanted to know about Audi's latest incarnation of the TT. Audi is once again producing a five-cylinder engine – and a very special one at that. Arriving at dealerships this summer, the TT RS has a turbocharged 2.5-liter engine with direct gasoline injection; it produces 250 kW (340 bhp) and 450 Nm (331.90 lb.-ft.) of torque. The blazing five-cylinder engine enables the TT RS to perform extraordinary feats. In conjunction with quattro permanent all-wheel drive and a high-performance chassis, the engine makes the compact Audi TT RS a top-notch sports car – available as a coupé or roadster. Sporty five-cylinder gasoline engines have a long legacy at Audi. The most famous is arguably the turbocharged 2.1-liter engine in the Audi quattro. The first version, which was launched in 1980, offered an impressive 147 kW (200 bhp). And the Sport quattro from 1984, directly inspired by motorsport, delivered a whopping 225 kW (306 bhp). For 25 years, turbochargers and quattro have been a dynamic formula for success. Audi has resumed using this recipe. Designed from scratch, the five-cylinder engine combines a turbocharger with FSI direct gasoline injection to elevate the TT RS to a high-performance sports car. The TFSI delivers 250 kW (340 bhp) from a displacement of 2,480 cc (151.34 cu in): a specific output of 100.8 kW (137.1 bhp) per liter. The power-to-weight ratio is also outstanding. In the case of the Coupé, which weighs in at a mere 1,450 kilograms (3,196.70 pounds), the power-to-weight ratio is just 4.3 kilograms per bhp. The Roadster has a weight of 1,510 kilograms (3,328.98 pounds) and a power-to-weight ratio of 4.4 kilograms per bhp – thanks to its extremely lightweight and largely aluminum body constructed as per the Audi Space Frame principle. The TT RS Coupé rockets from 0 to 100 km/h (0 to 62.14 mph) in 4.6 seconds; the Roadster needs just a tenth of a second longer. The limited top speed of 250 km/h (155.34 mph) is merely the official figure for both versions; as an option, Audi can increase it to 280 km/h (173.98 mph). Almost even more impressive is the aggressive pulling power. The maximum torque of 450 Nm (331.90 lb.-ft.) is always available between 1,600 and 5,300 rpm. In addition, the TT RS overtakes without the slightest effort. Last but not least, its engine makes passengers' skin tingle time and again thanks to its speedy and powerful response, its inspiring free-revving character, and its unmistakably guttural tailpipes: five-cylinder classical music by Audi! As an uncompromising sports-car engine, the 2.5-liter TFSI is ultra-compact. Just 49 centimeters (19.29 inches) in length, it is ideally suited for transverse installation in the TT RS. And its weight of just 183 kilograms (403.45 pounds) also sets a record. The crankcase is made of vermicular-graphite cast iron. This high-tech material unites the utmost in strength with low weight; it has otherwise only been used for the large TDI engines from Audi. Perfectly placed reinforcements enhance the block's loadability. The lightweight cylinder head, the pistons, and the connecting rod are lightweight as well as high-strength. The ultra-powerful five-cylinder engine is extremely fuel-efficient, requiring an average of just 9.2 liters/100 km [25.57 mpg] as regards the Coupé (Roadster: 9.5 l/100 km [24.76 mpg]). Switchable flaps in the intake manifold mix the incoming air in a calculated configuration. Injected at a pressure as high as 120 bar by the common-rail system, the gasoline swirls intensely in the combustion chamber – which in turn cools the walls. This subsequently facilitates a compression ratio of 10.0:1, which is very high for a turbocharged engine. Both of the adjustable camshafts, controlled via chains, also enhance charging efficiency with respect to the air-fuel mixture. The large turbocharger generates up to 1.2 bar of boost pressure. The intercooler, fed air ideally by the lower segment of the single frame radiator grille, reduces the temperature of compressed air by over 80 percent at full load. When an Audi TT RS driver pushes the standard Sport button on the center tunnel, a flap installed in the left exhaust tailpipe renders the exhaust noise even more robust and intense while boosting engine responsiveness. An optional Sport exhaust system is available with matt black tailpipe trims and sound flap. The Audi TT RS is the first classic sports car in the Audi RS family. Like the RS 4 and the RS 6, the Audi TT RS was developed by quattro GmbH as a pure, no-holds-barred driving machine. A new six-speed manual transmission conveys the engine's tremendous power, and permits easy and precise operation thanks to a specially designed shift lever boasting particularly short shift travel. The transmission's defining characteristics are a high efficiency ratio and a sportily narrow spread of the gear ratios. The Audi TT RS features quattro permanent all-wheel drive as standard equipment. Its heart lies at the rear axle: an electronically controlled, hydraulic multi-plate clutch. If a situation calls for it, the clutch redirects a majority of the torque input from the front wheels to the rear wheels. Within milliseconds, a powerful electrical pump in conjunction with an accumulator presses together the clutch's plates via hydraulic pressure. Additions to the quattro powertrain include a constant velocity joint before the propeller shaft and a compact rear-axle differential – both are heavy-duty components. The quattro drivetrain grants the Audi TT RS outstanding traction, fascinating dynamics, and superb stability. Winding rural routes or some laps around a racetrack allow the superior handling to shine. The precise and responsive steering, the instantaneous reactions of the chassis, the neutrality at the cornering limit, the grip while exiting a curve, and – time and again – the engine's thrilling power: every mile in an Audi TT RS exudes the distilled essence of sportiness. The chassis of the Audi TT RS builds on the cutting-edge foundation of the base TT design. The four-link rear suspension, which handles longitudinal and lateral forces separately, plays a crucial role. The electromechanical steering is highly efficient and the power steering adjusts to the vehicle's speed. With aluminum in the front and sheet steel in the back, the body's innovative mixture of materials results in a well-balanced axle-load distribution, excellent crash safety, and the outstanding rigidity which lays the cornerstone for the car's precise handling. The standard sports chassis, which lowers the body by 10 millimeters (0.39 inches), features tightly tuned springs and shock absorbers. The optional Audi magnetic ride adaptive damping system allows the driver to select one of two modes for the shock absorbers by simply pushing the Sport button. Dynamic mode enables the TT RS to hug the road; Comfort mode provides a pleasantly balanced ride perfect for long journeys. The sportiest version in the TT model line boasts 18-inch wheels fitted with 245/45 tires. They are complemented by mighty ventilated disc brakes, which measure 370 millimeters (14.57 inches) in diameter at the front and 310 millimeters (12.20 inches) at the rear. So that heat dissipates quickly, the front friction rings are perforated. They, in turn, are connected by hollow pins to the aluminum brake discs, which are encircled by black four-piston brake calipers made of aluminum and bearing RS logos. The Electronic Stabilization Program (ESP) can be switched off partially or entirely. In Sport mode, the engine does not intervene to monitor traction and, correspondingly, the brakes engage later than otherwise. In the second mode, the ESP is fully deactivated. At just 4.20 meters (13.78 feet) in length, the vigorously compact Audi TT RS hints at its explosive potential from the very first glimpse. The front spoiler tapers downward into a splitter, reminiscent of a racing car. The large and squared air inlets have diamond-shaped inserts. And the high-gloss black single frame grille with a frame in matt aluminum look and the TT RS badge bear the same styling. The xenon plus headlights with LED daytime running lights notify faraway drivers that an Audi TT RS is approaching. The sides of the vehicle are accentuated by large wheels in 5 twin-spoke design, vigorous side sills, and exterior-mirror casings in matt aluminum look. At the tail end, the two large oval exhaust tailpipes – spaced apart – are encircled by a diffuser insert. Here, too, is a TT RS badge. A stationary rear spoiler is standard, though customers can opt for one which automatically extends and retracts. Thanks to a drag coefficient of just 0.3, the 2+2-seat coupé and the two-seat roadster glide effortlessly through the wind. Audi offers the TT RS in eight colors. Among them are four exclusive options: Daytona Gray, pearl effect; Mugello Blue, pearl effect; Sepang Blue, pearl effect; and Suzuka Gray, metallic. The Roadster's soft top comes in black or dark gray. The dynamic exterior of the Audi TT RS is matched by the interior. The leather multifunction sports steering wheel has an especially thick rim, is flat-bottomed, and is covered with perforated leather. Integrated in the instrument panel, the driver information system can display boost pressure and oil temperature as well as a lap timer for chronicling feats at the racetrack. The door handles consist of two slim strips – typical of Audi RS models. An automatic climate-control system and the concert sound system are standard, as are an electrohydraulic soft top and an electric wind deflector for the Roadster. The entire interior is black. The heated sports seats feature an Alcantara/leather combination with silver contrasting stitching and embossed TT RS logos in the front backrests. Additional badges and logos appear on the steering wheel, in the rev counter, and on the door sill trims. The inlays are made from brushed aluminum. Floor mats feature silver piping trim; footrests and pedals are in aluminum look. Audi offers TT RS customers a diverse range of optional equipment: variably styled wheels measuring 18, 19 or 20 inches in diameter; bucket seats with folding backrests; seat upholstery in Silk Nappa leather with perforations or Fine Nappa leather with special TT perforations; inlays with Ibis White or Phantom Black paint finish as well as matt aluminum-look inlays for the exterior. In addition, there are high-tech navigation and multimedia systems available. 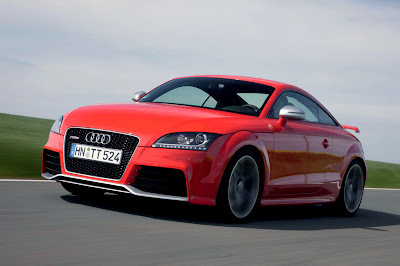 Sales of the Audi TT RS begin in March; deliveries are scheduled to begin this summer.